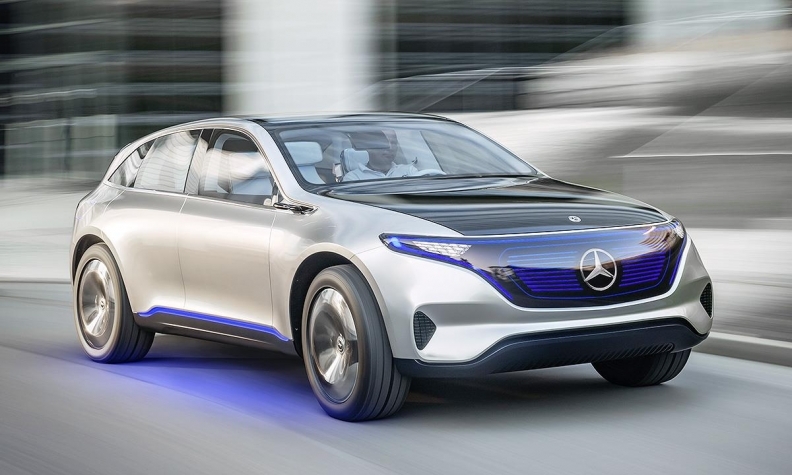 The Mercedes EQ concept previews a near-production electric SUV. STUTTGART -- Daimler may make batteries and Mercedes-Benz electric cars in China as part of a drive to manufacture more products locally and to try to boost sales, according to the automaker's market chief Hubertus Troska. Sales of the German company's luxury cars in China have grown 28 percent so far this year after Mercedes spruced up its designs to give its cars a sportier and upmarket feel, gaining traction with drivers in the world's largest car market. To keep the sales momentum, Mercedes is considering local production of electric cars and batteries. Building a battery factory in China is "among the options," Troska said, adding that no decision had been made. He declined to say whether Mercedes had set a date to start production of an EV based on the Generation EQ concept in China. The concept, which previews an almost production-ready SUV, was unveiled at the Paris auto show this year. Mercedes aims to have more than 10 all-electric vehicles as part of an EQ subbrand by 2025 and has pledged to produce its Generation EQ model by the end of the decade. The SUV is based on a C-class platform which is already being made in China and local authorities are encouraging production in the country. "The strategic plan by the authorities is to push battery electric vehicles. We continue to invest in both battery electric cars and hybrid," Troska said, adding the lack of battery charging infrastructure meant hybrids would be an alternative in the interim. Mercedes sales in 2016 have been better than expected, reaching 429,000 cars, Troska said, adding demand for locally manufactured cars had helped boost registrations. "I am confident that Mercedes in China will show a decent performance next year," Troska said. "Sales of the C class in the past year were phenomenal and we cannot build enough GLCs," he said, adding the new E class would likely add momentum into 2017. Efforts to bring down pollution have led Chinese authorities to come up with a new system of incentives to encourage sales of zero-emission cars. Chinese authorities are considering a system of trading credits for low polluting cars much like one in California, Troska said. This month, China introduced a 10 percent tax on luxury cars costing more than 1.3 million yuan ($189,000). But it is not expected to significantly dent sales, as customers were already prepared to pay high prices for some top-end Mercedes models such as the Maybach S class, with around 500 of the model selling each month, Troska said. Overall, Chinese customers still prefer sedans to SUVs, although there has been a shift toward the smaller C class rather than the E class. Demand for SUVs continues to grow, Troska said. Beijing Benz Automotive has been producing Mercedes passenger cars since 2005. In 2015, more than two thirds of Mercedes vehicles in China were produced locally.